The Maltese is a fine-boned, but sturdy, hardy little companion dog with a luxurious silky white coat hanging straight to the ground on each side of a center part line. It is a member of the Bichon family and is one of the oldest European breeds. This breed is mild-mannered and affectionate, yet playful and full of animation. Despite its size, posses the vigor needed for an excellent companion. This breed is intelligent and easy to train but is very strong-willed. It enjoys being groomed, petted and fondled. This is Joey, he is the son of Champ. Champ is champion sired from Villa Malta lines. Champ has been our main stud for the past 5 years, but he is going to retire and hand the thrown over to his son, Joey. Joey has already produced some gorgeous puppies and is proudly following in his father's footsteps. He has a nice white coat, strong black pigment, and is very small and compact. Joey carries Villa Malta lines from both his dad and his mom. Joey's mom is Trinity and can be seen below. Willow is absolutely adorable and is AKC registered. 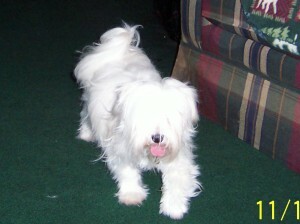 She has very good conformation, weighs around 6 pounds, and has a thick, soft coat with no tear staining. She is a wonderful mother and produces outstanding puppies. Ivy ia such a sweetheart, and she just loves to make people smile. We should get some very nice puppies from Ivy. She has a snow white coat and deep black pigment on her face and pads. We have waited a long time to get puppies from Lilly. She has a very silky coat, very little tearing, and good black pigment. Lilly's first litter produced 4 beautiful puppies. She really does have eyes in there, she just hates to have her hair pulled up! Meet our pride and joy! This is Angel, she is one of Champ's daughters, and her mother, who is pictured on my home page, comes from very good champion lines also. We have hopes of getting Angel into the show ring and could get some very nice show quality puppies from her. Here is Trinity with her first litter of puppies....it's hard for her to find time to get her hair done right now. 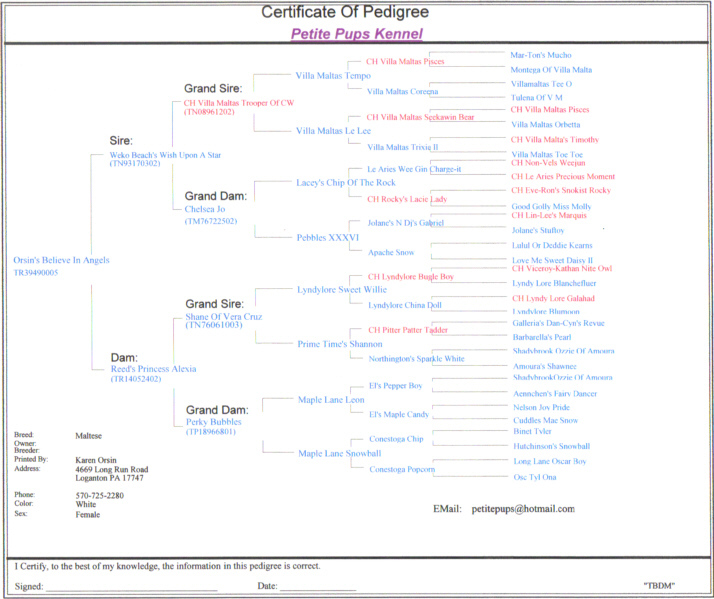 Trinity has a good pedigree and has some Villa Malta in her lines also. She is a very good mommy and loves to have a fuss made over her. This spot is reserved for our beautiful Angie. Angie is the daughter of Timmy and Angel. We don't have pictures yet, but they will be coming shortly. Angie is a small, compact, energetic little fur ball! She is snow white and has a thick, soft, silky coat with no tear staining. She is absolutely stunning and I'm sure her puppies will be too. Maltese - check out our Maltese information, read reviews, view photos and ask questions.